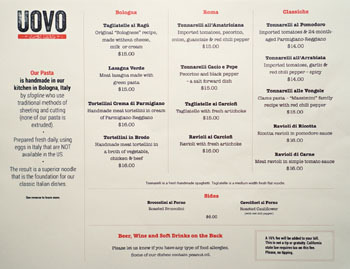 One of the more surprising Italian openings of the year has to be Uovo ("egg"), which dropped on August 22nd. The place comes to us from Emanuele "Lele" Massimini (co-founder of the Nozawa empire), as well as Carlo Massimini (Lele's brother, who serves as GM), Jerry Greenberg (also from the Nozawa family), and Lowell Sharon. Note that Greenberg and Sharon are also partners in HiHo Cheeseburger next door, and that Uovo is not part of Sushi Nozawa LLC, the parent company behind KazuNori and Sugarfish. 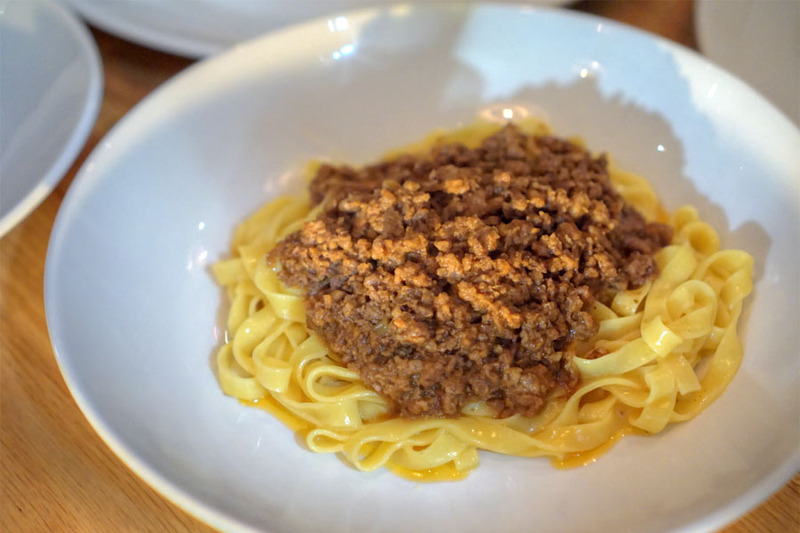 The "fine-casual" restaurant touts its pasta, which is handmade in a custom-built kitchen in Bologna (run by Pino Mastrangelo and Stefania Randi) using special eggs, then shipped Stateside. 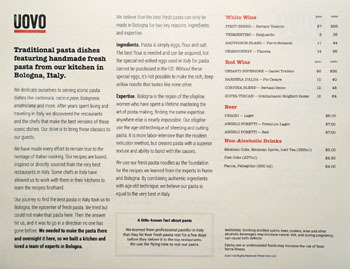 This pasta is utilized by Chef Gianni Pucci (most recently of Le Lacustre in Switzerland) to create "iconic" dishes in the vein of cacio e pepe and bolognese, the recipes of which are ostensibly based on the recipes used in some of the top eateries in Italy. Uovo is situated on the ground floor of the newly-constructed Chelsea apartment complex, and was penned by local firm Marmol Radziner. The 1,600 square-foot space features wide swaths of gray oak and a floor of reclaimed brick, and accommodates 42 diners, spread across the 24-seater pasta bar and eight tables. 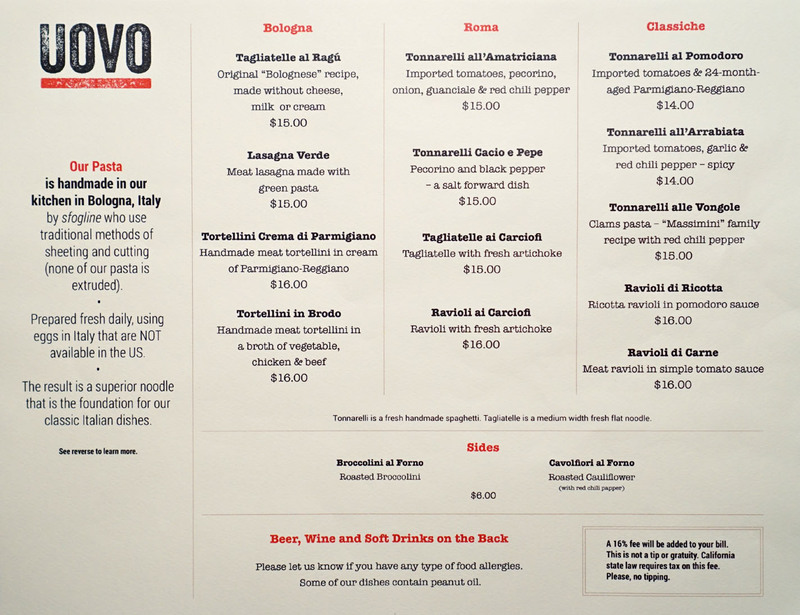 Uovo is clearly focused on the pastas, though there are a couple of sides as well (but no dessert). 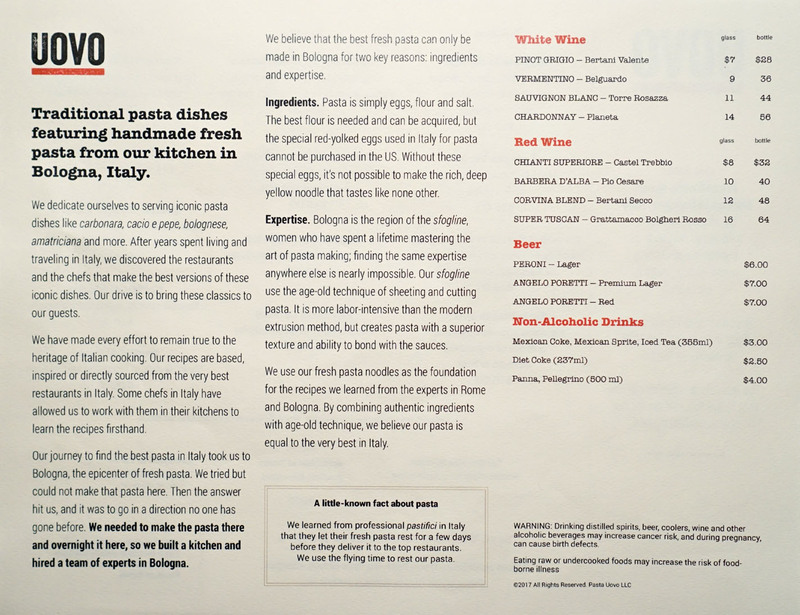 We ended up running the gamut on the menu, ordering one of everything except the clam pasta, which was unavailable. To drink, you get a trio of typical beers and eight Italian wines, half white-half red. Corkage was $20 a bottle, though we didn't end up being charged. Click for larger versions. We began with this O.G. preparation of ragù alla bolognese, which might be a bit of a revelation if you're used to the American version of the dish. The key difference? There was very little, if any tomato present. 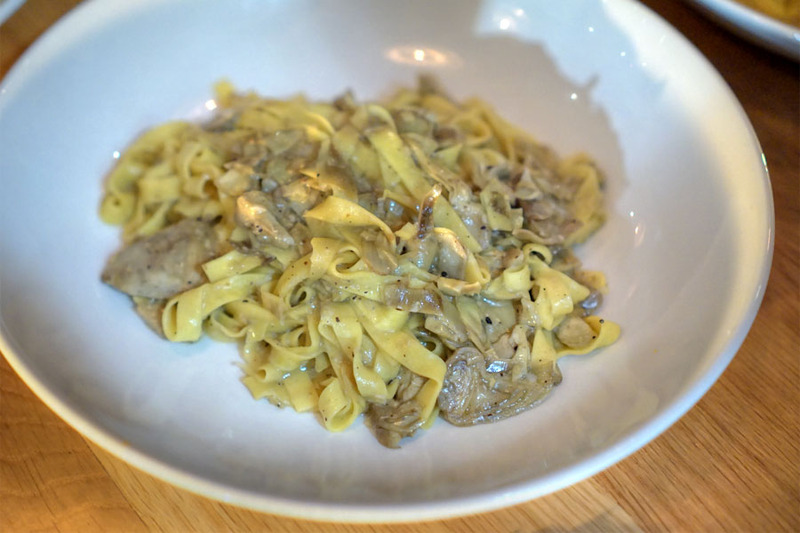 Rather, the focus was on the meat, which I found dutifully seasoned and comforting, a perfect pairing to the well-textured pasta. A favorite of mine. 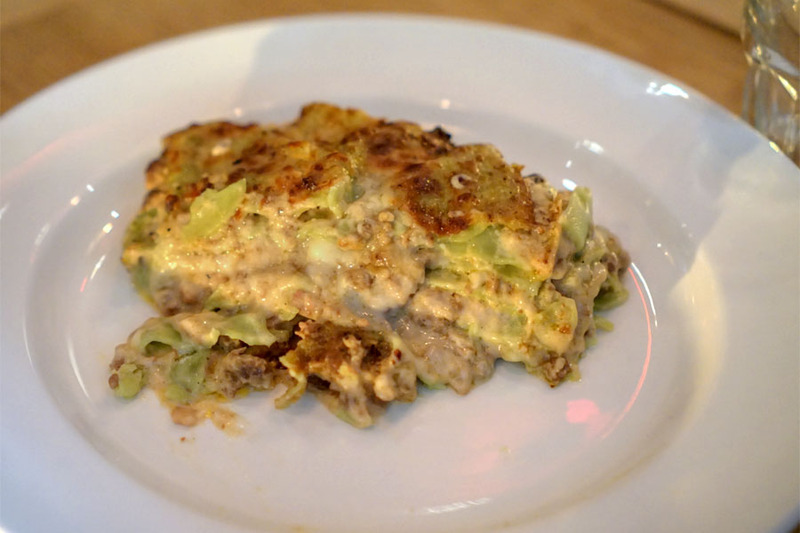 The lasagna was a cozy dish, marrying the richness of the meat sauce with a sort of tangy, vegetal quality. 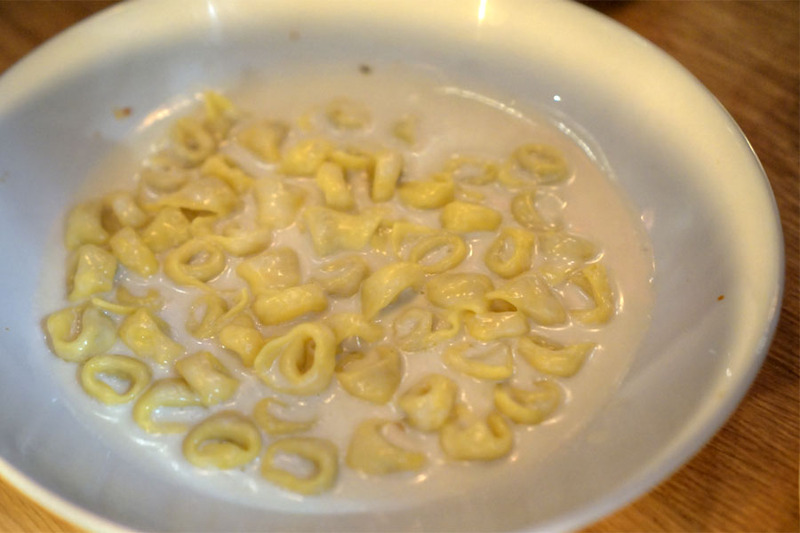 Give it a shot, especially since it's so different than all the rest of the pastas here. 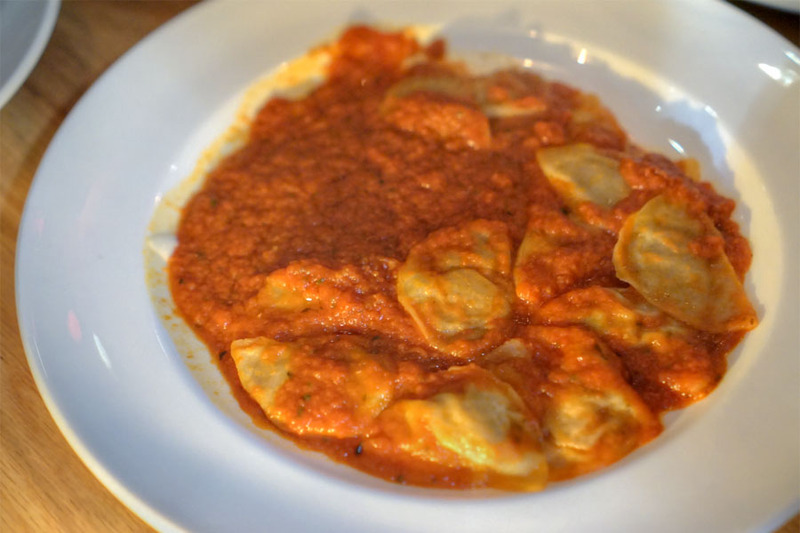 Our first of three ravioli courses was a table favorite, largely thanks to its straightforward combination of meat and a super vibrant, herb-accented tomato sauce. 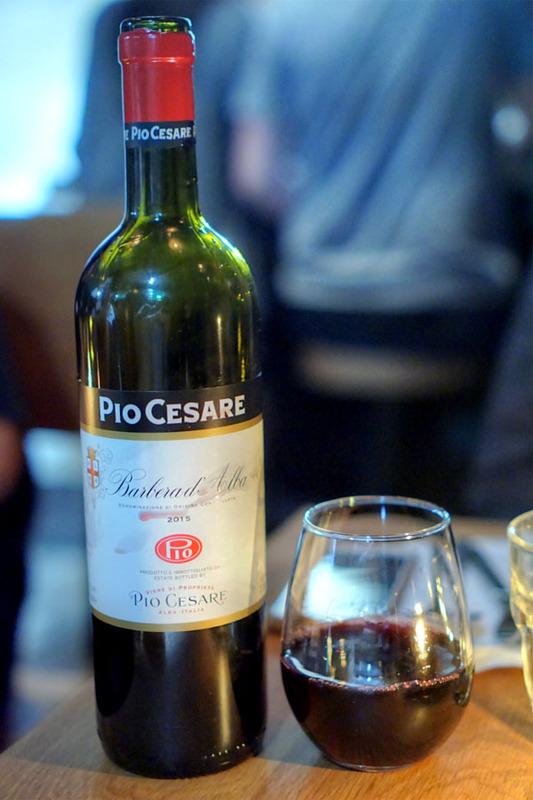 To drink, we started with some wine, the Barbera d'Alba - Pio Cesare 2015 [$40]. Aromas here were almost meaty at first, with a backing of booziness and a hint of mint. Taste-wise, I got strong herbs and spice, lots of dark, mature berry fruit, and a noticeable heat on the close. The first of two tortellini dishes definitely satisfied. I appreciated the bite on the pasta, as well as how well their filling of meat meshed with the luxuriousness of that cheese sauce. It just made sense. 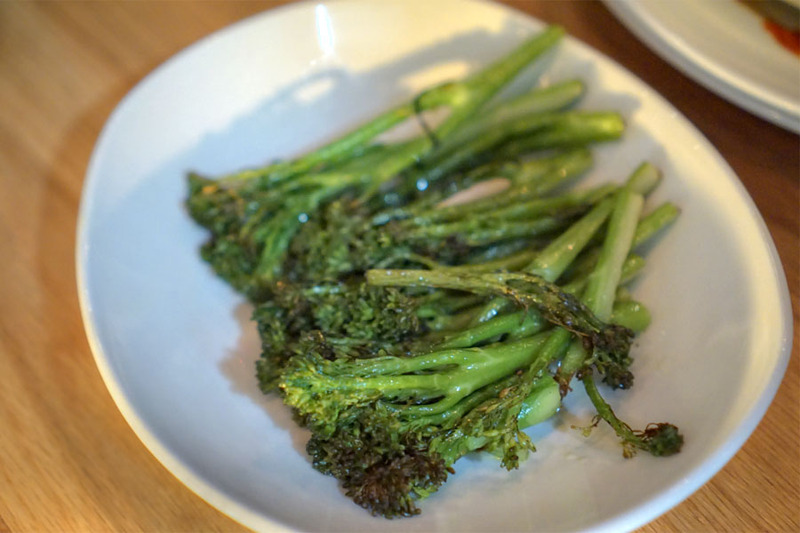 The broccolini was a winner, coming out as crunchy and bitter as I wanted, with a great savoriness to boot. 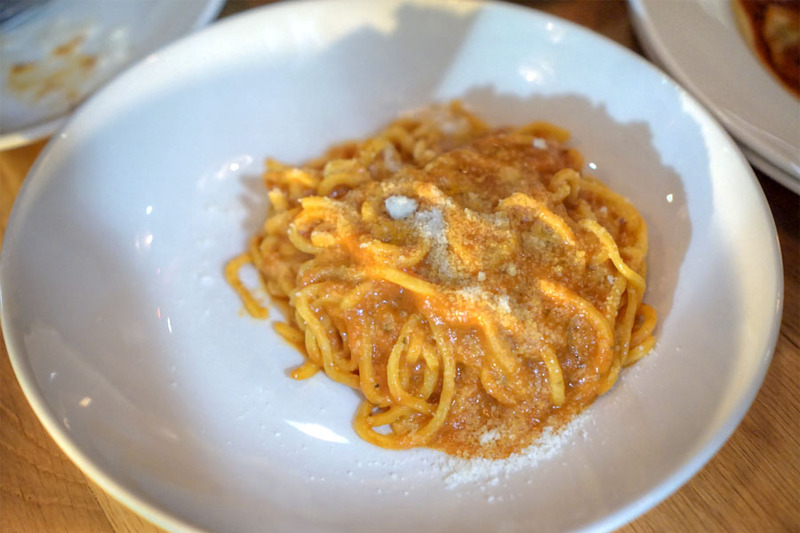 Tonnarelli is used in a number of dishes here at Uovo, and in all cases the pasta just had a really gratifying bite to it. In this presentation, it paired beautifully with an uncomplicated tomato sauce, which was heightened by just a smidge of spice and herb, as well as a kick of salt from the Parm. 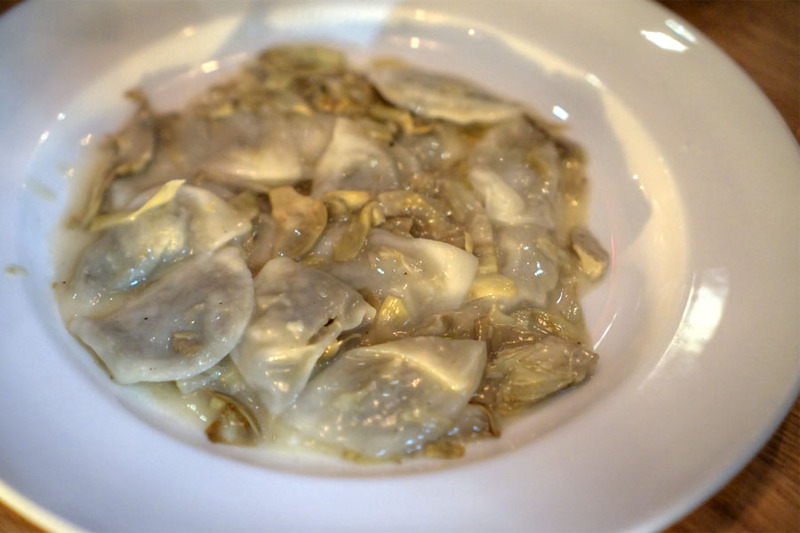 Here, the ravioli did a nice job showcasing the pure, unadulterated flavors of artichoke. With the wine all drunk up, we moved on to some beer. 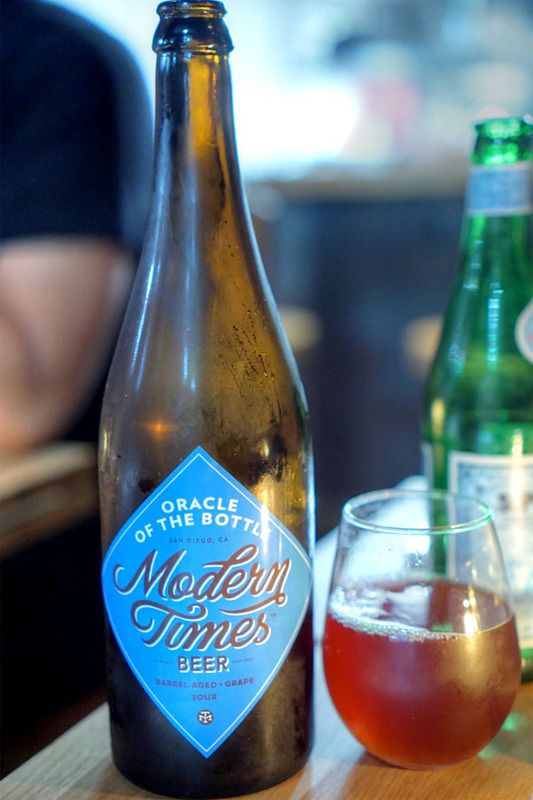 The 2017 Modern Times Oracle of the Bottle was a blend of red wine barrel-aged dark sour beers, fermented with Lacto/Pedio/Brett, with Tempranillo grape must added. Its nose went in a tart, acidic direction, with undertones of grape. The taste I found bright and acidic, with yeasty, oaky notes finished by a distinct vinous quality. 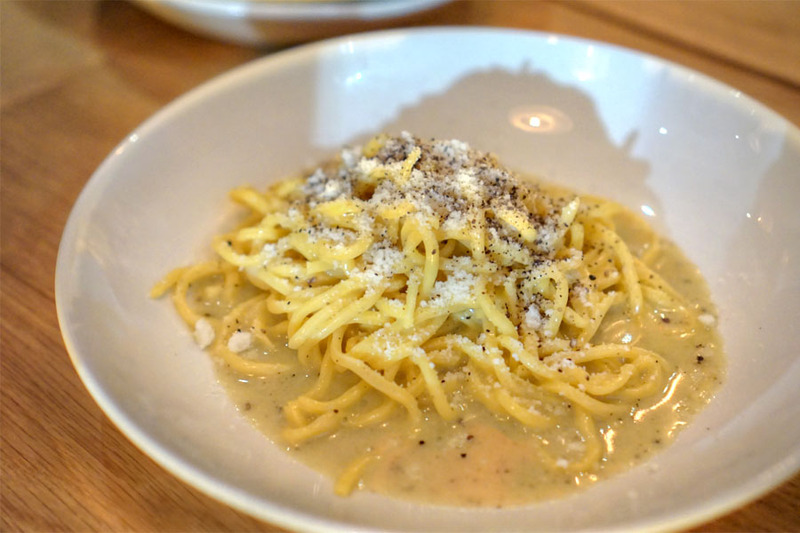 Uovo's take on the classic cacio e pepe hit the mark. I loved the back-and-forth here between the pepper and the heft of the cheese, which had an almost blue-like intensity to it. A crowd pleaser. 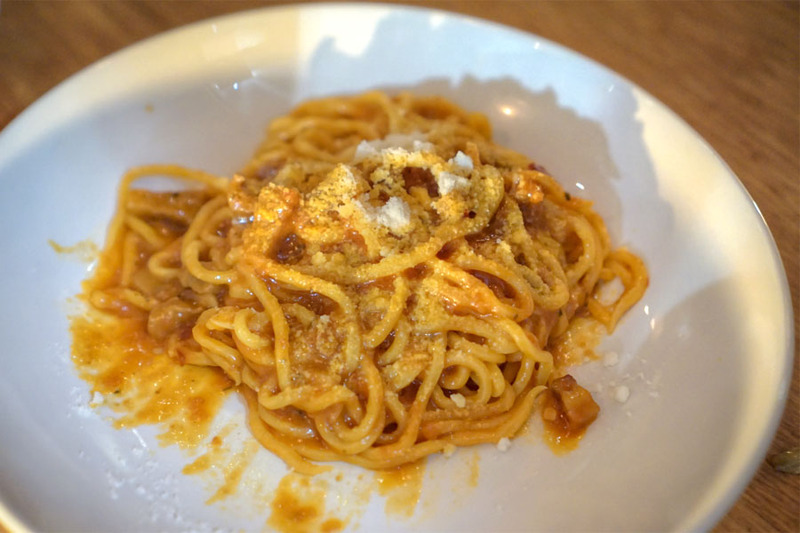 The amatriciana was another favorite due to its delicious interplay between rich pork cheek, tangy tomato, and spicy pepper. And again, great texture on those noodles. 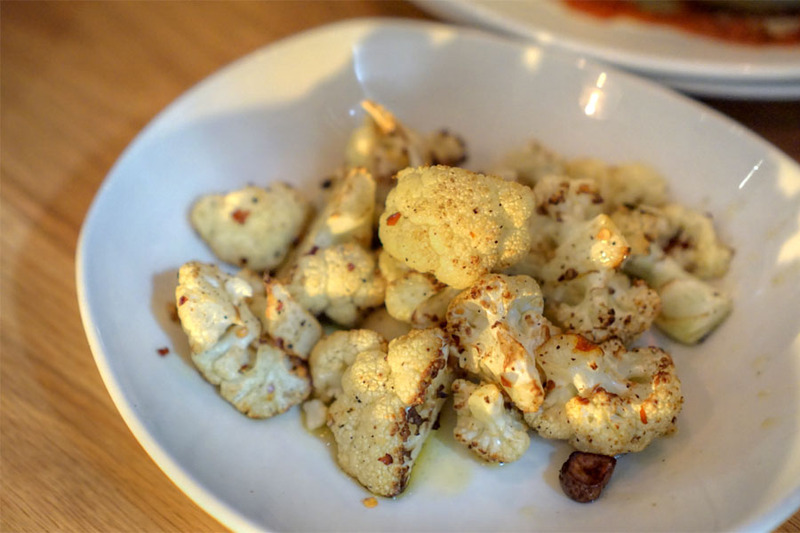 Cauliflower was softer than I'd prefer, but tasted spot on, with proper amounts of char and chili-fueled heat. 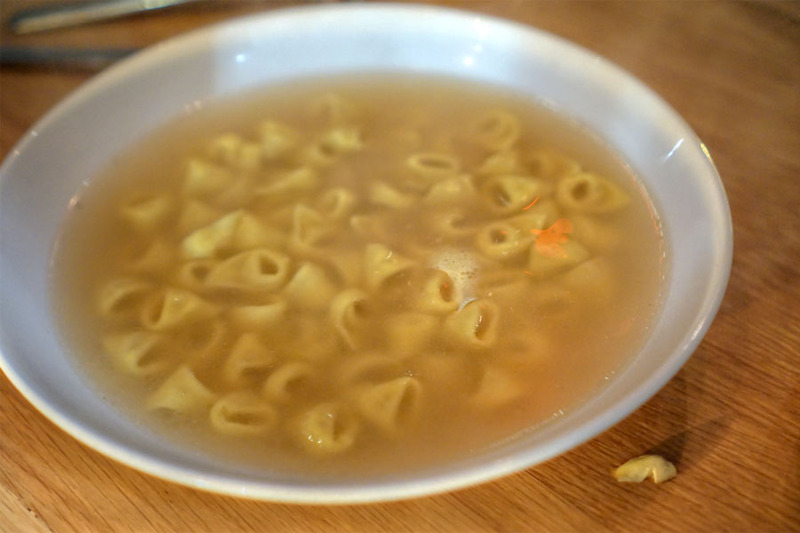 The tortellini were even better when taken in broth form, as the meat really sang in conjunction with that light, tangy, homey soup. Another standout. 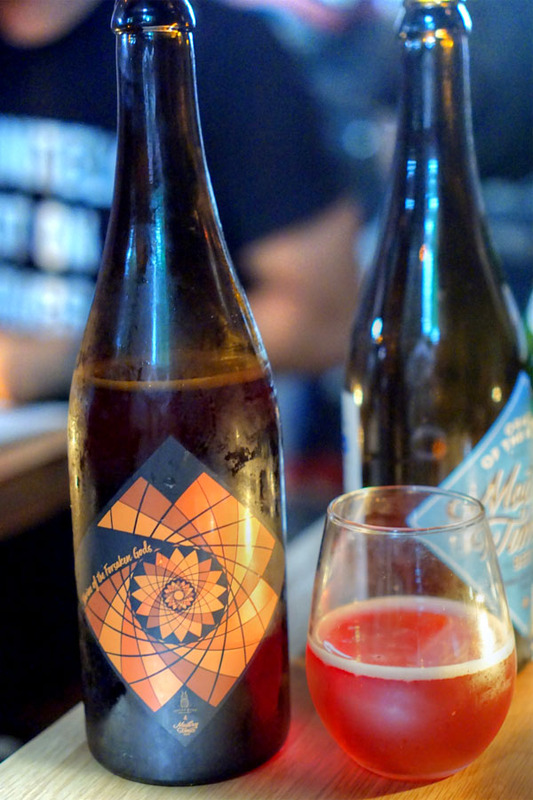 Our second beer was the 2017 Modern Times Shrine of the Forsaken Gods, a blended sour ale refermented with raspberries that was created in collaboration with Jester King out of Austin, TX. Aromas here were decidedly Smucker's-like and made quite an impact. That jamminess continued on to the palate, where it was joined by a restrained sourness, acidity, and a touch of barnyard. Yum. 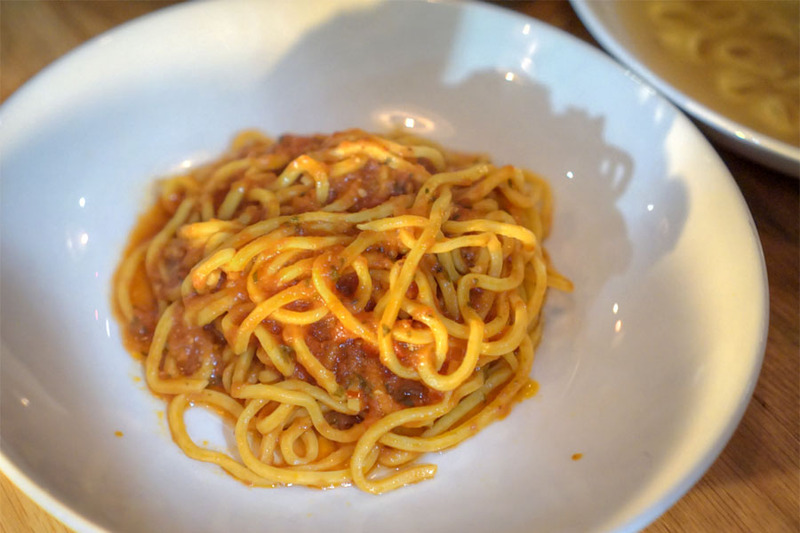 The sugo all'arrabbiata really shone, delivering a tasty blend of tart tomato and creeping spice that I rather enjoyed. Here, artichokes came out with a delicate, but somewhat smoky quality, and made for a fitting match for the slick strands of pasta. Our final dish just worked with its fusion of light, creamy, slightly gritty ricotta and a tart tomato sauce. 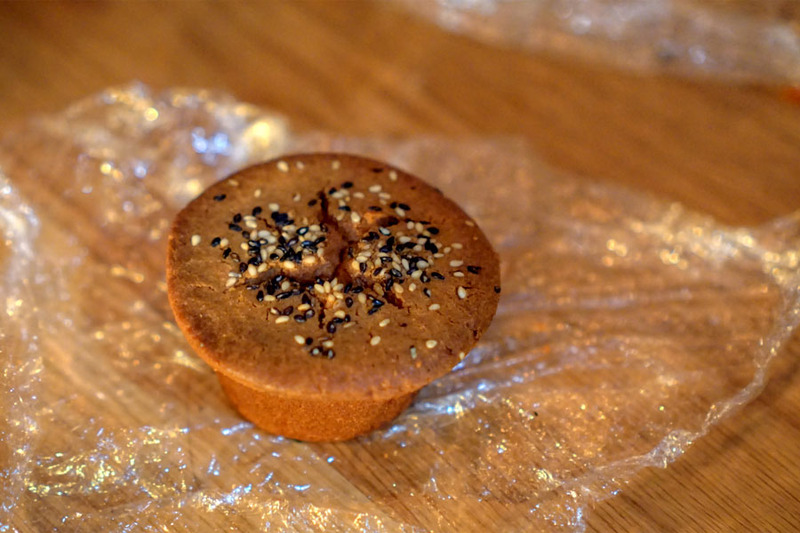 Uovo doesn't offer any dessert unfortunately, so one of my dining companions brought along some mochi muffins, the work of Sam Butarbutar, who operates Third Culture Bakery out of Catahoula Coffee in Berkeley, CA. Texturally, they had a chewiness to 'em that was offset by the crispness of their exteriors. Flavors, meanwhile, were dark and caramel-y, with a tinge of pandan and a wonderfully nutty contribution from the sesame seeds. 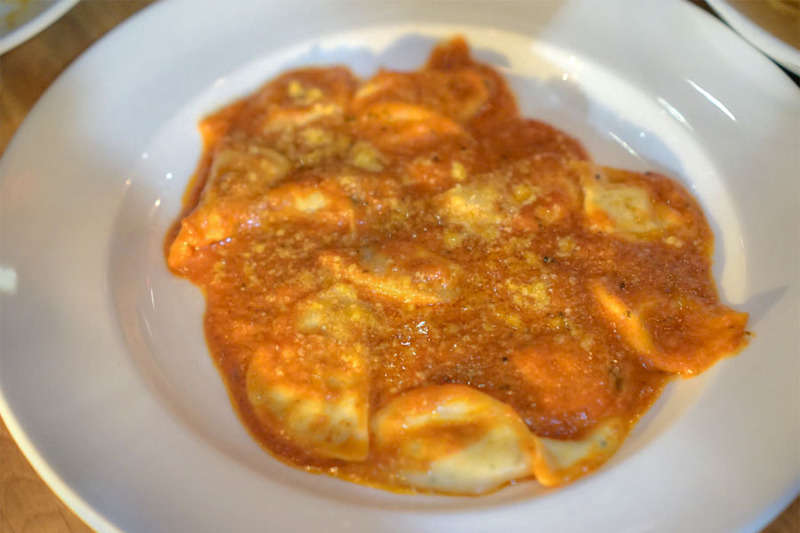 There are a lot of Italian restaurants in the Los Angeles area, but none quite like Uovo. I appreciate the singular focus of the place, the sort of fanatical obsession with pasta that they have going on. The result is a set of dishes that have a distinctly different vibe than what you'd find at most of our City's top Italian joints. The food has a purist type of approach that's actually refreshing in its clarity and simplicity. I could definitely envision Uovo expanding into multiple locations, like Sugarfish did, so I guess we'll wait and see. I am eating two pieces of KFC original recipe chicken and coleslaw. I can't wait to try this place, the pasta looks so delicious and their prices are so reasonable you can try quite a few different dishes. Thanks for the review.